Alumni leaders from Asia, South America, and Europe share perspective and receive training. 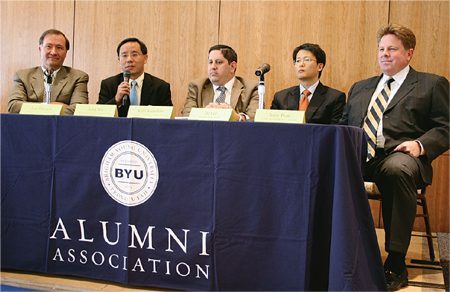 During a conference for leaders of BYU’s international alumni chapters, some of the participants joined a panel discussion to share they perspectives on international employment issues with students. Fifteen countries were represented this fall as nearly two dozen international alumni chapter leaders met on campus for a conference. “There are great resources to be gleaned from our international alumni, and the international arena has become a vital area of interest for the BYU Alumni Association,” said Lew W. Cramer (BA ’73), an executive alumni board member who works with international interests. The two-day program preceded the October general conference of The Church of Jesus Christ of Latter-day Saints and included workshops on chapter leadership strategies, an international reception, and a panel discussion on international employment for students and alumni in the area. Lue indicated the strongest common link among international alumni may be the Church. “Everything is tempered by their faith,” he said. “One of our most successful events was a reception between sessions of general conference.” The reception in the Joseph Smith Memorial Building in Salt Lake City attracted about 250 people. Several of the international chapter leaders participated in a panel discussion on international employment. The panel discussion underscored some of the challenges that come from working in another country and attracted hundreds of BYU students and alumni to the Hinckley Center’s assembly hall. “A lot of Americans in China speak the local languages, which is significant,” added John W. Shi (MA ’88), the chief representative for the Mallesons Stephen Jacques law firm in Beijing. Jerald T. Pratt (BS ’82), the executive director of Debt Capital Markets for CIBS World Markets in Canada, suggested that students consider Canada as an opportunity for international work. “Many Canadian companies recognize and respect BYU, which opens a lot of doors for BYU graduates,” he said. All panelists expressed the need for technical skills in any area of international business. “Technical skills are vital. They cannot be emphasized too much,” said Shi.